JLPOW 3.2 ft gold-plated XLR DMX cable,great value 6 Pack--- Your Reliable Cables for Worry Free Performances. ❤ Flexible PVC Jacket: Soft even in cold winter,great flexibility makes easy rolling and unrolling. ❤ Sturdy Design: Gold-plated XLR pins,Metal connectors and chuck type strain relif ensure a longer lifespan. ❤ Quality materials: The heavy gauge oxygen-free copper conductors are encased in copper braid shielding to provide stable signal . 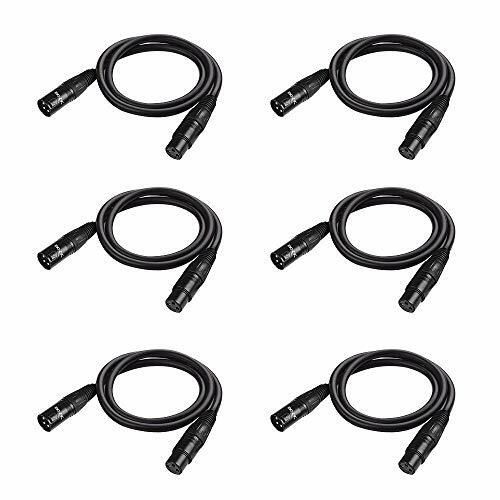 ❤ Convenient and Cost-effective 6 pack, JLPOW 3.2 feet DMX Cables is your sensible choice for interconnecting stage lighting, mic, or audio equipment. 6 * 3.2ft DMX Cables. ✔ Premium Material: JLPOW 3ft DMX Cable constructed with oxygen-free copper, all copper conductors and inner copper braided shielding. Safety, shielding, and prevent transmission interference. ✔ Solid Build: Gold-plated XLR pins(Not Cheap Nickel-plated),Sturdy soldering point,Heavy duty metal connectors with molded strain relief increase durability and help easy plugging and unplugging. ✔ Flexible PVC Jacket: Soft PVC make it malleable for easy routing ,smooth pickup when finished. Mouldproof, waterproof, protects the cable from everyday hazards. ✔ DJ Essential: JLPOW 3 ft XLR Male to Female DMX Cable for various Stage lights: moving head light, par lights, spotlight ,up lighting with XLR input and output. ✔ 100% No Risk: 30 days money back,12 months quality warranty and professional customer service : support@JLpow.com .❤Note: Cables Only, stage devices in the pictures not included. If you have any questions about this product by JLPOW, contact us by completing and submitting the form below. If you are looking for a specif part number, please include it with your message.